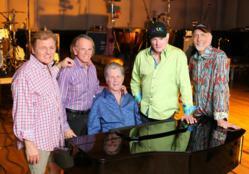 Beach Boys Bring Historic 50th Anniversary TourTo Riverbend Music Center in Cincinnati, OH on June 12. The Beach Boys, one of the world’s most legendary and influential bands, have reunited for a global 50th Anniversary Tour. Brian Wilson, Mike Love, Al Jardine, Bruce Johnston, and David Marks will tour together for the first time in more than two decades. On Tuesday, June 12 at 7:30 p.m. the Beach Boys will take the stage at Riverbend Music Center in Cincinnati, OH. The band, who performed together at the 2012 GRAMMY Awards, will also release a new studio album and commemorative 50th Anniversary catalog with Capitol/EMI. Tickets for the Cincinnati show are $55.00, $95.00 and $125.00 for Reserved Pavilion, $25 GA Lawn and a SPECIAL LAWN TICKET PRICE of $15.00 for the first day of the on sale ONLY (March 30) while supplies last. Tickets go on sale to the public on Friday, March 30 at 10:00am through Ticketmaster and riverbend.org. Ticketmaster customers may log on to ticketmaster.com; call Ticketmaster's national toll free Charge By Phone number 1.800.745.3000; or visit any Ticketmaster outlet including select Kroger stores. Up to the minute tour date and ticketing information can be found at thebeachboys.com. Exclusive VIP ticket packages will be available through VIP Nation, including premium seats, meet & greets, soundcheck access, exclusive merchandise and more. For more information please visit vipnation.com. The Beach Boys have recorded new songs for the as-yet-untitled album to be released in 2012. It will be the first to feature all of the band’s surviving original members in decades and is being produced by Brian Wilson and executive produced by Mike Love. The Beach Boys and Capitol/EMI have also teamed up for a 50th Anniversary campaign spotlighting the band’s entire catalog, with several new commemorative releases planned for 2012, including a new hits collection and a career-spanning box set. For five decades, America’s first pop band to reach the 50 year milestone has recorded and performed the music that has become the world’s favorite soundtrack to summer. The Beach Boys continue to hold Billboard / Nielsen SoundScan’s record as the top-selling American band for albums and singles, and they are also the American group with the most Billboard Top 40 chart hits with 36. Sounds Of Summer: The Very Best Of The Beach Boys is fast approaching triple-Platinum sales status, and The SMiLE Sessions, released to worldwide critical acclaim in November, has been heralded as 2011’s #1 Reissue of the Year by Rolling Stone magazine. Inducted into the Rock and Roll Hall of Fame in 1988 and recipients of The Recording Academy’s Lifetime Achievement GRAMMY Award, The Beach Boys are an American institution that is iconic around the world.